In nilgiri’s cooking classes, Ajoy introduces you to the pleasures of preparing Indian food. You will prepare Indian dishes, learn about Indian spices, culture and some of the myths of Indian cooking will be dispelled. 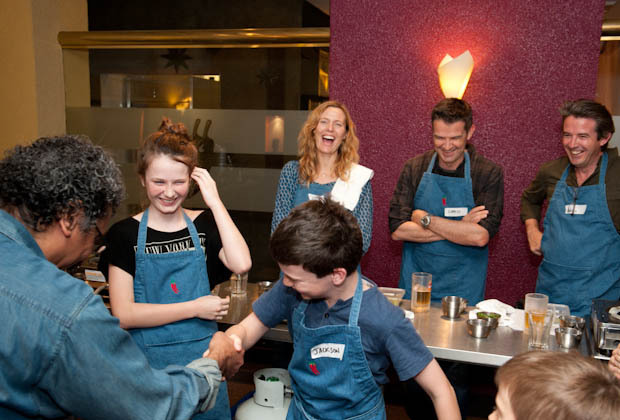 Whatever your needs are, nilgiri’s cooking classes are for adults / for office team-building groups / parent and child / children’s classes / dads / private classes (tailor make your own group!). Details of each class is set below! In small groups of 14, the cooking glasses are a fun, hands-on way to learn about cooking for the beginner, or to hone your skills if you’re already a cook. Classes last five hours, you get to eat what you cook whilst having great fun. Our adult cooking classes cost $140, including lunch and Indian nibbles. You can also buy a gift voucher for the cooking classes which is a perfect gift for Mother’s day or for a group of friends to get-together and do something different. We are fully licensed (no BYO). Click cooking class review to read a recent review of nilgiri’s cooking class. 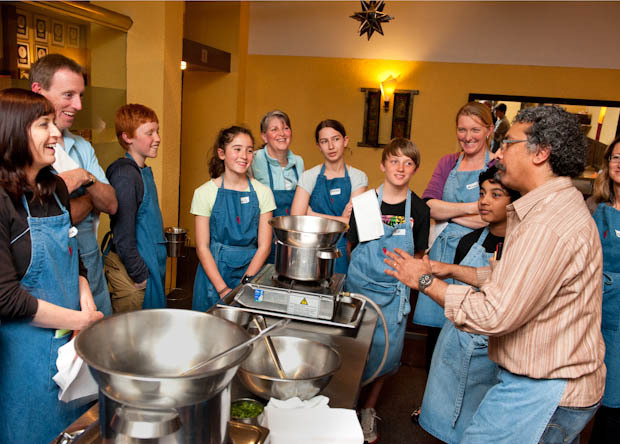 For companies and groups looking for new ways to increase the productivity of their staff, nilgiri’s team building cooking class uses cooking to boost staff morale whilst encouraging teamwork and communication. Our team building classes cater for lunch or dinner. You can choose whether you want a hands-on cooking experience or simply watch a cooking demonstration. Either way, you get to eat all the food that has been prepared along with delicious appetizers. If you choose our $140 hands-on team building class, with the full help of Ajoy and his team you will be cooking your own lunch/dinner. Working in small groups, you will be judged! 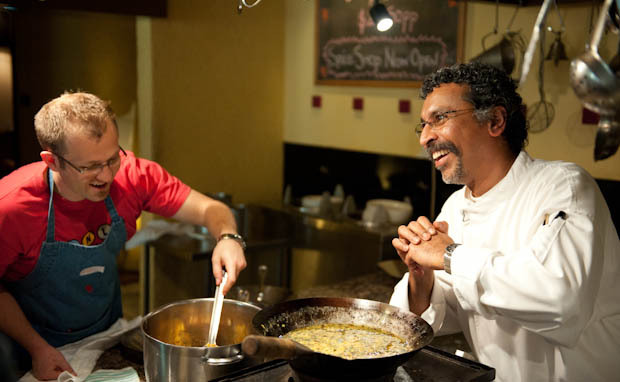 Do you have what it takes to be a chef at a top Indian restaurant? If you opt for our $60 cooking demonstration, Ajoy will prepare a special meal in front of you. You will sample superb appetizers during the session and at the end you will be served the meal in one of our Private Rooms. Our fine selection of wines can also enhance your team-building cooking course. Please note we are fully licensed (no BYO for the cooking classes). Call Ajoy now on 0411 463 485 to discuss your requirements. We offer parent and child cooking classes personally presented by Ajoy. 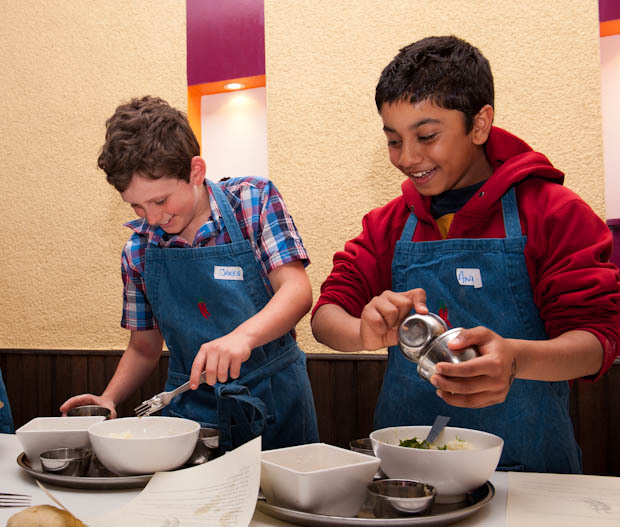 These hands-on classes are a superb introduction to the delights of Indian cooking. As a fitting end to the session, we eat the meal we have prepared. Our parent and child cooking classes cost $80 per adult and $40 per child. To participate in this course a child must be accompanied by an adult. Each parent and child will work as a team with Ajoy providing directions and help as required. At the conclusion of the parent and child cooking classes, students get to eat their meal with a complimentary soft drink, a perfect ending to the class. The classes are suitable for 5 to 6 parent and child “pairs”. Call Ajoy now on 0411 463 485 to discuss your requirements. 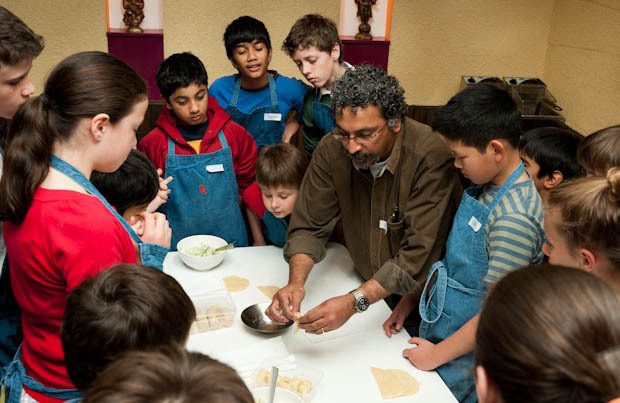 Our children’s cooking classes introduce kids to the fun of Indian cooking. Ajoy personally teaches the class how to prepare easy-to-make Indian dishes. Whether your child is a keen cook or if they’ve never touched a saucepan before, they will be inspired by this class. Children are given recipes and guided from start to finish, so at the end of the class they have created their own “masterpiece”! Your child will be keen to recreate the dishes at home. Classes last about an hour and the number of participants is around 15-20. The price of the class is $30.00 per child and the classes are suitable for children between the ages of 9-14. This is a fun and delicious way to spend an afternoon or host a birthday party. In our dads only cooking class, you will prepare Indian dishes and learn about Indian spices and cuisine. Our private group classes are ideal for those times when you want to do something special with friends, with your Mothers’ Group, or a surprise Birthday party. 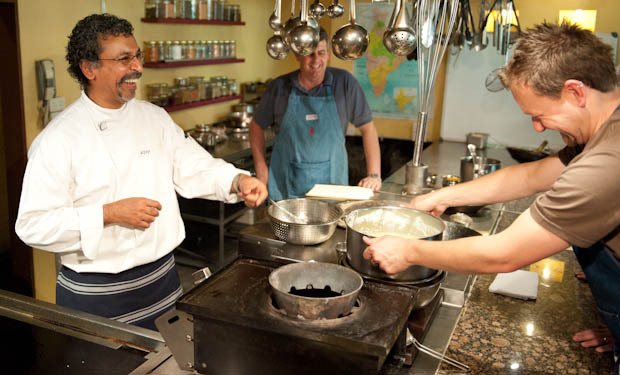 Catering for a minimum of ten people, our classes introduce the essentials of Indian cooking. These classes cater for lunch or dinner. You can choose whether you want a hands-on cooking experience or simply watch a cooking demonstration. Either way, you get to eat all the food that has been prepared along with delicious appetizers. If you choose our $140 hands-on class, with the full help of Ajoy and his team you will be cooking your own lunch/dinner. Working in small groups, you will be judged! Do you have what it takes to be a chef at a top Indian restaurant? If you opt for our $100 cooking demonstration, Ajoy will prepare a special meal in front of you. You will sample superb appetizers during the session and at the end you will be served the meal in one of our Private Rooms. I’ve done two of Ajoy’s classes now and can highly recommend them! It’s a full-day’s whirlwind of activity and great information, but all in a very friendly and welcoming atmosphere. And of course the best part is at the end of the day, when we get to eat a feast of great Indian food that is definitely “no damn curry in a hurry”. Thanks for your kind words and more importantly for the last phrase!! I was fortunate to work with Ajoy for a couple of years as a waiter while studying in my university degree course. I have to say that those were the best days of my life. I got to eat the best Indian food everyday, learnt cooking tips from the great maestro and most importantly I got some invaluable life lessons on how to be creative, perfectionist and a great leader. Ajoy is one of the few Indian chefs who can cook, talk, think and entertain at the same time….. he is a legend! Had he not been in cooking…. instead in computers for example… he would have been bigger than Steve Jobs! I went to Ajoy’s coking course today, came straight home and cooked what I learnt for my wife and mother-in-law. The lessons from Ajoy on techique really paid off, i can’t believe what I recreated after just 4 hours in the class. I’ve been cooking Indian for along time and thought I had a good handle on it but today taught me how much I really didn’t know and how much more there is to learn both about the culture and techique of true India cuisine. I will definitely be back for more and will visit the resturant really soon. Thank you Ajoy, a great day…..my wife thanks you! Great to hear that you had a good time and that you were able to cook some good Indian food from the heart for your wife and mother-in-law!! Mate have fun and happy cooking!! Do you teach how to make indian sweets like barfi and kulfi ? Also is the meat in the cooking classes halal ?